On December 9th, healthcare workers at Research and Menorah Medical Centers in Kansas City ratified their first ever union contract, with an overwhelming 92% voting yes. Since January 2011, members at both hospitals have been at the bargaining table, negotiating with one of the largest hospital chains in the US. Employees at Research and Menorah have supported forming a union at their hospital for quite some time, and they finally won their union last year. By ratifying their first contract, workers at Research and Menorah have now completed the organizing process and are officially members of SEIU Healthcare IL/IN/MO/KS. “This is a great win for our hospitals and for all of the working people in Kansas City,” said Anthony Baker, an EVS at Menorah. 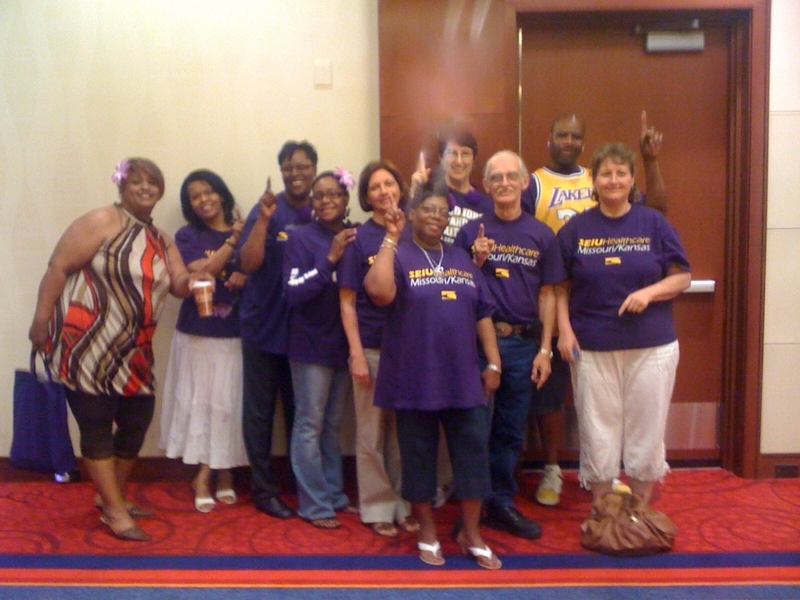 Throughout the year-long contract campaign, workers at both hospitals have come together to take action, from organizing sticker days to delivering cakes to management to holding rallies. By standing together, Research and Menorah workers won a strong contract and through the process, formed a strong union. “It’s great to finally have a voice in the way things are done here at RMC!” said Corita Brown, a dietary worker at Research. By granting a large tax break today to one of Illinois’ most prosperous companies, the Illinois House has concentrated more wealth in the hands of the rich, even as average workers are literally taking to the streets to decry growing income inequality. While we applaud the House for passing a separate bill that expands the Earned Income Tax Credit for low-wage households, the benefits of this measure are eclipsed by the magnitude of the tax breaks lawmakers approved for the state’s corporate heavyweights. For every one dollar in tax breaks the House has given to workers struggling to propel themselves out of poverty, it has doled out nearly two dollars to corporations making big profits. At a time when the state budget remains crippled by a chronic deficit – caused in part by the misconduct of wealthy financial institutions – we should be requiring the richest of the rich to pay more of their fair share. But this bill will extend more than $85 million in scarce state funds to CME Group, which compiled a staggering $900 million in profits last year. From the Occupy movements that have proliferated across Illinois, to the results of multiple public opinion polls, there is ample evidence that voters think our economy disproportionately favors the rich and greedy corporations at the expense of the 99 percent. In this environment, passage of this bill seems politically tone deaf. It also represents the kind of practice that helped catapult our state’s economy into its current crisis. We’re still recovering from an economic collapse caused by big banks and other financial institutions that made bets they couldn’t cover and then got rewarded with a huge taxpayer bailout. Now they’re reaping the same out-sized profits they made before the Recession, but they’ve yet to invest any of that fortune in jobs for out-of-work families. Even the House Majority Leader told the Chicago Tribune that this legislation is “probably bad policy.” The 91,000 low-wage healthcare and child care workers who make up our union, along with the rest of Illinois’ dwindling Middle Class, can confirm that it is. After all, they’re the ones who have been hardest hit by the high unemployment, plummeting housing values and declining state services that have been left in the wake of the Great Recession. Rather than double down and give more tax breaks to companies that gamble in financial markets, Illinois should close corporate tax loopholes and institute a tax system that requires rich individuals and greedy corporations to pay their fair share. 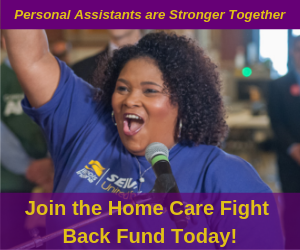 Our lawmakers should no longer tolerate an income tax system where the average Illinois home care worker makes $15,200 and pays the same tax rate as the CEO of CME Group. As we move into the next legislative session, we hope lawmakers will focus on reforms that will improve economic conditions for the 99 percent, not make matters worse. Thousands of union members, workers, students, Occupiers, the unemployed, and more traveled from all over the country this week to unite in Washington DC. Waiting hours in legislators’ offices, sleeping in tents and on floors, and marching through heavy rainstorms, our members sent the message that the American middle class has had enough of corporate greed and recklessness. 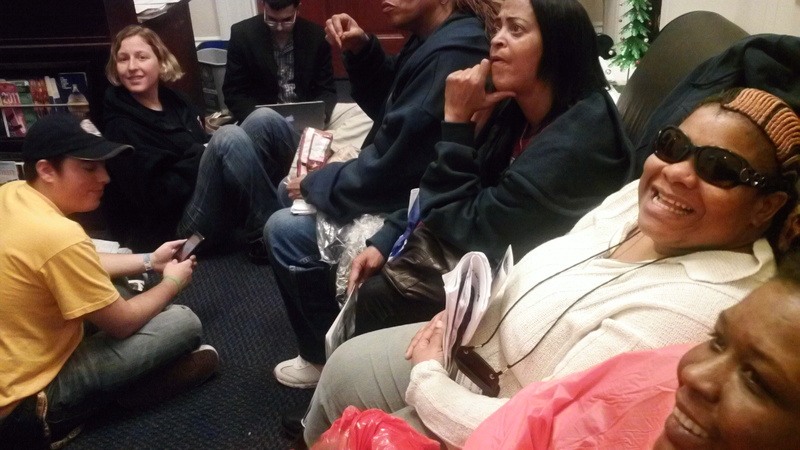 Our members camped out in lawmakers' offices for hours, hoping to engage them about the issues that matter to working people. In addition to shutting down K street and marching on the Capitol, members and allies camped out in legislators’ offices, hoping to talk to them about economic issues affecting the 99%. Some demonstrators succeeded in meeting with legislators, like Democratic Rep. Emmanuel Cleaver from Missouri, but others made themselves scarce when faced with the prospect of addressing the 99% face to face. Better watch out, CME Grinches: the 99% is coming to town! SEIU Healthcare Illinois and Indiana members spread a little Christmas cheer at the Chicago Board of Trade last week, conducting a Salvation Army-style mock charity drive for the CME Group. The CME Group has made headlines recently as its bid for a $100 million state tax break was overwhelmingly defeated by the Illinois House of Representatives, but the group’s demand for corporate welfare is likely to resurface in Springfield. Despite earning $900 million in profits last year, the CME Group has repeatedly threatened to leave the state, taking its jobs with it, if legislators don’t pander to its demands for a taxpayer handout. In spite of members’ Santa hats, festive bells, and lovely singing voices belting adapted Christmas carols like “CME gets tax breaks, and we get charged more, they’re the Grinch that stole Christmas, stealing from the poor!” to the tune of “We Wish You a Merry Christmas,” few passersby seemed interested in giving to the rich this holiday season. “These people have their hands out to get even more money from taxpayers, money we should be spending on things that the poor and the middle class need, like job creation and Medicare. People are losing their homes, their jobs, they don’t have money for food, and the CME is threatening to take their jobs out of the state if we don’t give them $100 million? Everyone knows that’s a scare tactic. It’s blackmail,” said DORS PA Flora Johnson. After the demonstration at the Board of Trade, members went across the street to the Occupy Chicago site at Jackson and LaSalle to deliver lunches to protesters there.